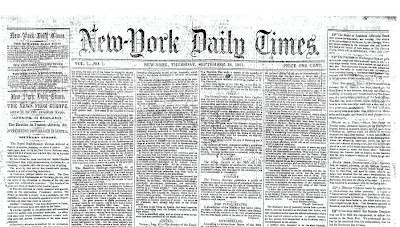 the nytpicker: The Gray Baby: On This Day In 1851, NYT Launches For The Very Reasonable Price Of One Cent. The Gray Baby: On This Day In 1851, NYT Launches For The Very Reasonable Price Of One Cent. And at the risk of seeming downright sychophantic, here's a link to a pretty cool piece of fiction by the novelist Michael Chabon, where he imagines the run-up to the NYT's first issue. "Not bad", "very reasonable"? You're losing your edge and getting soft on them. also, the prepositional phrase introducing that sentence needs something to attach itself to, something that could take this sort of risk. And at the risk of seeming downright sychophantic, here's a link to a pretty cool piece of fiction. And at the risk of seeming downright sycophantic, we're providing a link to a pretty cool piece of fiction.